A man struck actor Brad Pitt in the face while he was signing autographs. 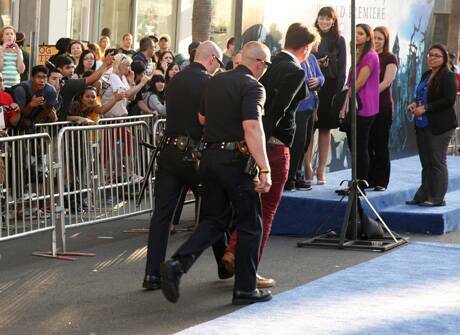 Witnesses saw the man from the fan area jump over a barrier to the red carpet. A man was led away in handcuffs after attacking Brad Pitt on the red carpet at the Hollywood premiere of the movie “Maleficent.” Pitt was apparently unhurt and soon resumed signing autographs. A man struck actor Brad Pitt in the face while he was signing autographs at the Hollywood premiere of a film starring partner Angelina Jolie, police said on Wednesday. Pitt, a Golden Globe-winning actor, was at the premiere of “Maleficent”, at the El Capitan Theater in Hollywood, California, when the man leaped over a fence and hit him, said Sergeant Leonard Calderon of the Los Angeles Police Department. Pitt was not seriously hurt and authorities quickly subdued the man, who was arrested for misdemeanor battery and remained in police custody on Wednesday night, Calderon said. “The officers who were handling him said it looked like it was intentional, but at this point, it remains to be determined,” Calderon said. The suspect did not appear to be armed and investigators had not yet interviewed him to determine a motive, Calderon said. “Maleficent” is Disney’s modern reimagining of the “Sleeping Beauty” fairytale, and Jolie stars as the film’s villain.